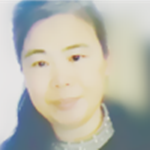 I myself am professional translator. 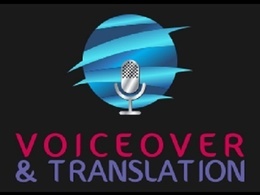 I have also a group of international voice artists: UK, US English, Chinese, Malay, Spanish, Italian, French, Russian , German, Korean, Swedish,...Read moreI myself am professional translator. I have also a group of international voice artists: UK, US English, Chinese, Malay, Spanish, Italian, French, Russian , German, Korean, Swedish, Norwegian,Portuguese, ,Czech and Dutch... All our native voice artists are experienced in producing professional and high quality audio recordings ( synchronizing with video) able to record all kinds of charming and magnetic voices in mp3 or wav to meet your requirements, perfect for your video presentation, business promotion, broadcasting and education. Pls feel free to contact me for voice samples. 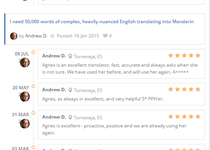 Agnes was great.. really dilligent, really helpful and I wouldn't hesitate to work with her again - and I probably will! Agnes has pulled another couple of rabbits out of the hat for me.. Excellent communication, delivery and service! 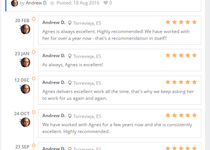 Agnes you’ve done a fantastic job and very prompt to respond. I really appreciate your efforts and look forward to our next project - keep it up! Great job, communicated throughout. Highly recommend! Agnes is great to work with. Very professional and very reliable. Recommended! Dutch (native language) Voiceover - Female. Yet another professional voiceover done quickly and with great comms. Many thanks. Another great job. Great comms, great quality, super fast. Great quality of the voiceover! Thank you, Agnes, it was a pleasure to work with you.